2018/07/11 New Internet Host for LymPHOS2 (sorry for the unavailability time). 2015/11/18 Updated quantitative data in LymPHOS2 DataBase. 2015/08/05 LymPHOS DataBase update (experiment 36 and quantitative data). 2014/08/01 Updated to LymPHOS2 code-base and DataBase. 2014/04/25 Updated to integrate protein chromosome information. 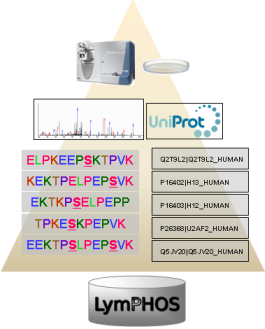 LymPHOS is a web-oriented DataBase containing peptide and protein sequences and spectrometric information on the PhosphoProteome of human T-Lymphocytes. It is possible to Search phosphorylation sites for both proteins and peptide sequences, or browse the entire database, where experimental data (annotated mass spectra) will support every phosphorylation site assignment. An accurate description of the experimental design can be found in the Experimental section. More detailed information on LymPHOS background and the people at the CSIC/UAB Proteomics Laboratory can be obtained at the About section. For specific descriptions of the LymPHOS features have a look at the documentation in the Help section. LymPHOS Web Application is designed using the Django Framework and the Python Programming Language. LymPHOS DataBase and Web-App by Laboratori de Proteòmica CSIC/UAB are licensed under a Creative Commons Attribution-NonCommercial-ShareAlike 4.0 International License.